You will save the amount needed for the purchase faster than the equivalent loan will be repaid because what would have been the interest portion is adding to your savings. If you saved until what would have been the last loan repayment day then you will end up with more cash than the original purchase price, again because of the interest portion. 2. Opportunity Cost. This is rarely if ever discussed when people discuss debt but it should be considered as its effect can be considerable. If you don’t make the purchase or defer the purchase then the money you would have used to fund the debt repayment can be invested to generate a return for you elsewhere. It’s important to note that these statements are based on the assumption that the purchase does not rise in price at a rate higher than the interest charge. If this was the case then you would also have to include the opportunity cost (including considering the risk of that other opportunity) of deploying the debt repayment s elsewhere. If after this calculation the price was still rising at a faster rate then the debt may actually help with wealth creation while also giving instant gratification. Let’s use a simple example to demonstrate. Average Bob, Average Jane and Average Joe are all looking at a potential purchase. Let’s say they have seen a piece of Art that they like which costs £10,000. While looking nice this piece of Art is not expected to either increase or decrease in value. Note that by choosing an example where we see no decrease in value it represents the worst case for wealth creation. Had I chosen a car, a holiday or a new sofa as the example then the wealth creation opportunity is greater. Average Bob decides to go for it and takes out a 5 year loan with an annual interest rate of 5% so he can get instant gratification. Average Jane decides she’ll save the equivalent to what Bob makes in repayments under the mattress and will buy an equivalent piece of Art in 5 years time. Average Joe decides to also defer the purchase for 5 years but he chooses to invest the money that would have been used to repay the loan into a FTSE All Share Tracker Fund, within an ISA, which over the 5 year period earns a 7.5% return per annum. To make the maths easy we’ll also assume the repayments, savings or investments are only made once a year at the end of the year. Bob has been making loan repayments of £2,309 per year for 5 years, has had great satisfaction looking at what he has bought every day and ends up with an asset and wealth of £10,000. Jane has been saving £2,309 per year under the mattress. She buys her Art after 5 years so also has an asset worth £10,000 but is also left with £1,548 of cash left over which makes here satisfied. Buy simply deferring the expenditure and hence not making the interest payments she has a net wealth which is 11.5% greater than Bob. Joe has been saving £2,309 per year into his ISA. He also buys his Art after 5 years so has an asset worth £10,000 but is also left with £3,415 in his ISA which makes him satisfied. 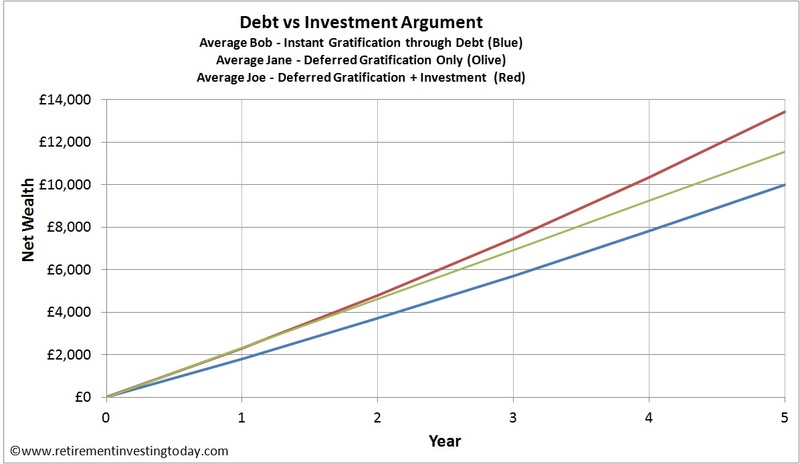 By deferring the expenditure and hence not making the interest payments plus taking some risk by investing the money (the Opportunity Cost portion) Joe ends up with 34% more wealth than Bob. Since I started on my focused journey towards Early Retirement I have always acted like Average Joe and continue to do so going forward. 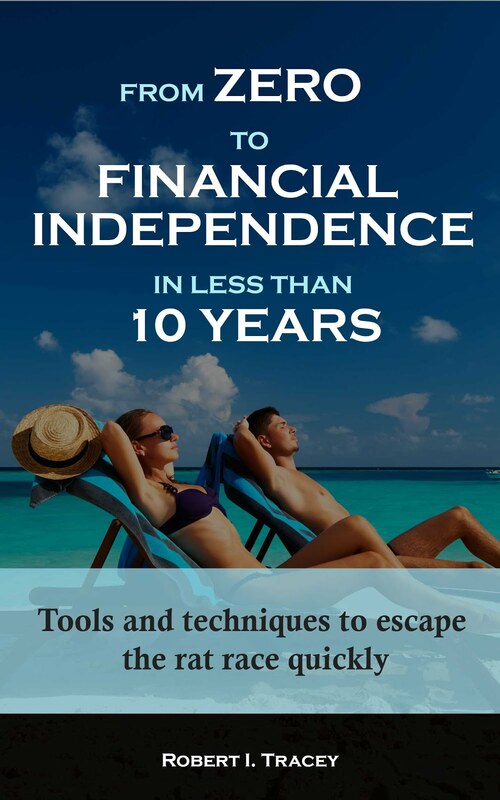 I am conscious that I am deferring instant gratification in exchange for wealth creation. I am doing it because I want to build my wealth in the fastest possible time. The difference between Joe and I is that at the end of the savings period Joe bought some Art where I’ll be buying gratification in the form of Financial Independence. Finally, one other point to note is that by first focusing on wealth building, then gratification I have found that I am in the position where for any purchase that I could now ever want to make, except for a home, I would no longer need a loan to support the purchase. Even the home mortgage I would still need is getting closer to not being required as I sit on the sidelines, renting humble accommodation, that is far below the standard of living that I could secure either through renting or a mortgage while saving the difference. Thought provoking as ever RIT. Of course, during the period of delay, you can always go off the idea of the original purchase. I think the bigger question however is to what extent our consumerist culture softens up the senses of the masses. Everywhere we turn we are subjected to advertising - our schools, our clothing, our TV, the internet. It has become such a routine part of everyday life, nobody really stops to think about what its doing to us. Our pleasures are defined by how much we consume - whether its consumed now or delayed, somewhere along the line we got a little lost. The adverts keep us all hooked into the system of borrow and spend (or invest and spend). Where are the leaders with a little vision to point toward an alternative? Mr Money Mustache - we need you now! In 1974 I took out a bank loan to buy a new car - the only new car I have ever owned. I told my girl friend "there is going to be a huge inflation, so the bank is really paying me to borrow money". That worked out very well, especially since the car lasted 15 years. Otherwise I've never borrowed, bar a mortgage. However I bought something on HP recently, because they wouldn't give me a discount for cash. I hadn't known people still offered HP - I think of it as something from the 50s. The other problem with the debt is that you are tied into it until it is repaid. In my early 20s I took out a loan to buy a car (which i still own today!) and grew to resent the fact that I had to repay £200 a month on what was then a fairly modest graduate salary. "It’s important to note that these statements are based on the assumption that the purchase does not rise in price at a rate higher than the interest charge.... If after this calculation the price was still rising at a faster rate then the debt may actually help with wealth creation while also giving instant gratification." I.e. like a house, the usual thing that people borrow to buy? ...and plummeted in the last five, and continues to do so. "Of course, during the period of delay, you can always go off the idea of the original purchase." A very good point. I now never buy anything on a whim. 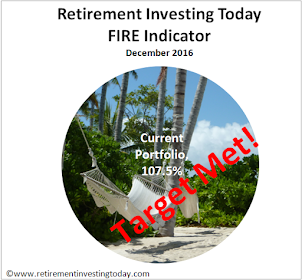 Pre-Retirement Investing Today I made the car loan mistake as well. It wan't a new car but it was nearly new and in hindsight it definitely damaged my wealth creation. Let's see if they have still rocketed in value 5 years from today. I don't see it occuring but of course I might be wrong. Past performance is not an indicator of future performance springs to mind. Good stuff although like a previous commentator has said, what if the asset goes up in value in that time greater then the interest payments? With so many 0% deals on credit cards these days being available, I don't see why people who are investing over instant gratification, aren't taking advantage of it.